Look outside the box and go on the ultimate adventure! Enter the exciting world of myth and monsters, the paranormal, UFOs and extraterrestrials, lost treasures and mysterious places. Delve into these awesome legends and learn how easy and inexpensive it is to search for the subjects of these stories, and what you’ll need to look for them. Robert Robinson presents this epic guide to the stranger sites in America and gives you some valuable pointers on legend tripping out your back door. Chapters include: Legend Tripping; Bigfoot; Other Cryptids; Bigfoot Legend Trip; Aquatic Cryptids; Aquatic Cryptid Legend Trip; Haunted Sites and the Paranormal; Paranormal Legend Trip; UFO Sites and Ghost Lights; Extraterrestrial Legend Trip; Treasure Legends; Treasure Legend Trips; Critical Thinking; The Experience; Legend Trip Locations; Outdoor Survival; Equipment and Tools; Your Legend Trip Begins Now! ; Who’s Who in Legend Tripping; Legend Tripping in Popular Fiction; more. 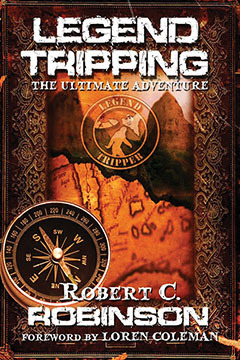 LEGEND TRIPPING: The Ultimate Adventure By Robert C. Robinson, Foreword by Loren Coleman. 322 Pages. 5x9 Paperback. Illustrated. Maps. Bibliography.